It is April and the shop is bursting with new samples and great classes. To celebrate our 10th shop anniversary we want you to have 10% off your purchase the day of your class. All students and instructors will receive a 10% discount on all items purchased the day of their class. This does not include your class registration price. Can't find the right class at the right time? You can have a one on one class or build a private class for you and a friend or two. Call us at (336) 779-6155 to get started. This class makes a great kit for storing your sewing or art supplies. It is perfect for you or a friend. Lee will show you how to sew this up and you'll leave with a finished kit. Join Heather & Kelly as we sew flannel blankets and burp cloths for the NICU at Forsyth Hospital. Bring your own sewing machine or use one of ours. If you can't sew please come and help us cut. Find out more on our Facebook page "Sewing for Babies Winston-Salem". This quilt pattern was inspired by a stack of 2.5" fabric jelly rolls. Join Lee to make this fun and easy quilt. This class would be a good choice for a beginning quilter. This is a new class for beginning sewers who want to learn to sew. Students will learn the basics of the sewing machine and will master sewing straight lines. They'll make a simple project that will be rewarding and fun. Age is not important, but ability to sit and learn is required! Make a beautiful new wallet to store your credit cards and more You will leave this class with a completed wallet. Once you've made one you'll want to make a few more as gifts. Come join Lee and Ann Monroe of May Chappell to finish up those pesky UFOs. You can ask all your questions and get guidance to finish things up. Or you can create a new project with Lee's color guidance. Bring your project and use our Bernina sewing machines. Don't fear the zipper! You'll learn the basics of pouch construction and how to put a zipper in a bag. A great class for confident beginners. In just one class you'll learn to make this fabric floral wreath. This quick and easy wreath mixes my love of fabrics and crafting. This beautiful 16" wreath is perfect for any interior door. After you learn how to put your wreath together you can finish at home. You've seen them in the shop now you can get started. 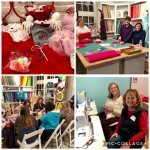 Join Heather of Village Fabric Shop for a fun day of collaging. We will spread out and use the new space in Old Salem "Salem Stitches". We will have everything you need: a big 6' table for each student and all of the supplies to make your collage. Come to the shop early to order from our collage catalog. We will also bring in boxed Panera Bread lunches for $15 per person. This easy class uses your fabric stash to decorate a flour sack towel. You'll learn to applique and add touches to make great gifts for yourself or your friends. Did we mention we sell flour sack towels for $3 each! Quilt backs can be as interesting as the front. This class will focus on creating a quilt back worthy of your quilt top. You will leave armed with lots of ideas for design as well as some basics of quilt math. Perfect for all level quilters. Please bring a quilt top or pattern to class for design ideas. Our friend Jessica is bringing her wristlet class back. This cute wristlet is a fun and simple project. She will provide the pattern as part of the class fee.